Any truth to the rumor that CDTA is shutting down? I'll take acronyms for $800 Alex, What is CDTA? That's why they call them "rumors." I was looking around for a Cadet Special Activity I could attend and found this one. There are three campuses, one in Texas, one in Maryland, and the last in New Mexico. I am fond of San Antonio (been there occasionally over the years) so applied (late) for the one in Texas, was accepted and am going to go. I have learned that in Texas they still have a few senior member openings for specialized positions (like transportation) so if you want to go apply now and you probably should contact the staff. PM me for an email address. I can confidently say no. CAP is full of higher-tech areas, and Cyber Defense fits perfectly into this. Yes, the Maryland and Texas campuses are full-speed ahead for this summer. Between the two campuses this year, more courses will be offered than last year. CDTA continues growing steadily. Looks like there was some truth to this after all. Thanks to all of you who put in the work to make this happen for our cadets, it was very much appreciated. Interesting. I wonder if that is related to the sudden firing of all TXWG CP staff, as CDTA started in TX. Interesting. I wonder if that is related to the sudden firing of all TXWG CP staff, CDTA started in TX. The TXWG CP staff purge is entirely unrelated. This is all really unfortunate. This leaves us with no path for true cyber security training. 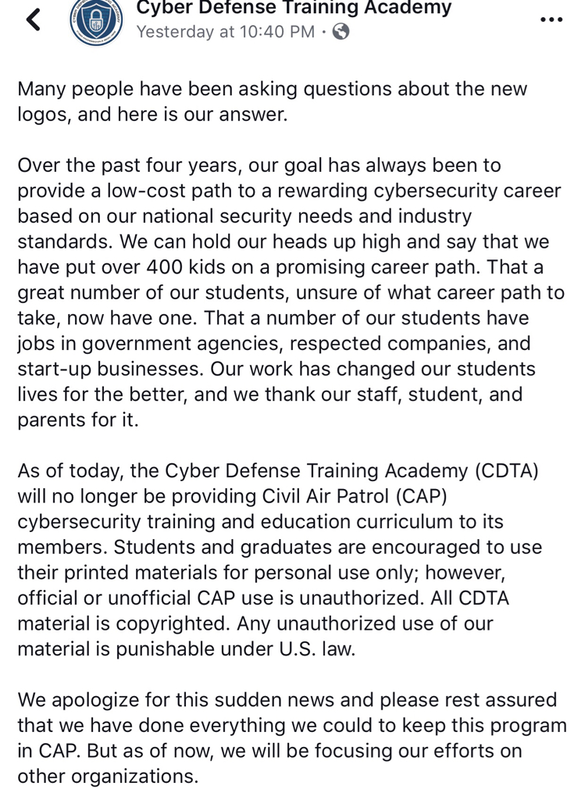 And CyberPatriot isn’t the answer, a program that relies on local expertise for your cadets to succeed with no path for any sort of certification. As a member of the National Staff, I can assure you CAP will have a cyber NCSA with multiple campuses next summer. CyberPatriot is only one piece of the overall cyber plan. The forthcoming new Aerospace Dimensions module, wing/region cyber activities, and potential opportunities with Air Force partners are being worked on now. Within Cadet Programs, Cyber is growing! We have added additional staff and reshuffled assignments to accommodate the significant new emphasis on cyber in coordination with our USAF colleagues. As Paul pointed out, we will absolutely be offering our successful cyber NCSAs, and adding some cyber in at every level. "Cyber -- Now More Than Ever Before!!" Nothing says "thanks for your business" like "...punishable to the fullest extent of the law...". in-house IT resources CAP has and be developed internally so that it can and will be released publicly. Their policy on restricting their training materials always bothered me. In that respect I won't miss them, and I look forward to a more open courseplan like the cyberpatriot slides.